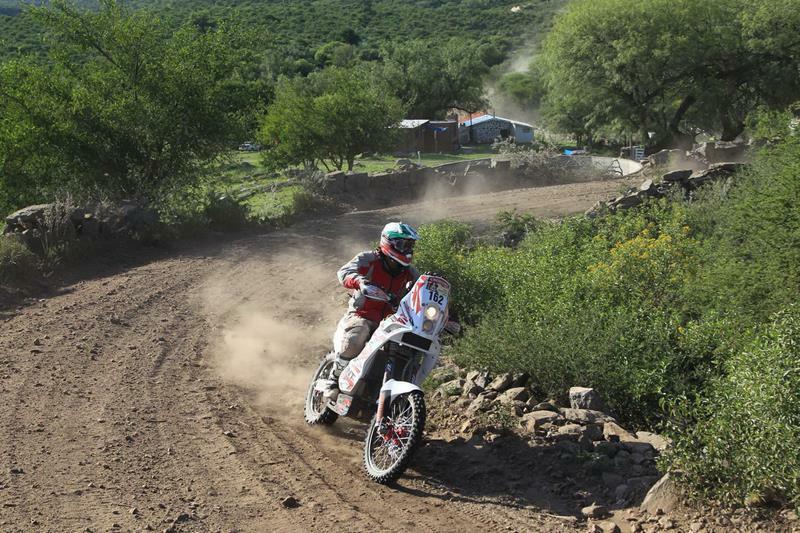 Stage 12 of the 2013 Dakar saw the remaining UK based riders continue to deliver results despite battling fatigue and injury. Tim Forman was once again the highest placed Brit finishing in 36th place on the stage, a result that has moved him up to 32nd overall. Forman said: “I definitely had a better day than yesterday. I started the stage a lot steadier than I have been as I wanted to take my time and make sure that I didn’t have an silly crashes. I caught the quads and made sure I past them in a sensible spot and then just made sure I was spot on with the road book. “I ended up riding with a guy from South Africa we were both on a very similar pace so I followed him while check navigating us both so that we didn’t make any mistakes. I probably could have finished a bit higher if I’d have attacked the quads at the start because there was a lot of dust again. Stan Watt had to deal with pins and needles and a loss of feeling in his right hand – a result of his shoulder dislocation two days ago. He still managed to end the stage in 42nd place and maintains 31st in the overall standings. “The first half of the stage was good and I past about six or seven bikes, but in the second part I couldn’t really hang on as I woke up this morning with pins and needles in my hand. It was a bit of a struggle in the sand and Tim passed me with about 30km to go. Simon Pavey was back on the pace after a tough day yesterday finishing the stage in 59th which puts him 61st overall. He said: “It was a beautiful stage with big sand highways running through the desert. It was a bit fast for my liking and although I started riding at about 130kph I slowed down to around 110kph which meant I felt fresh and was able to ride fast on the technical parts and the dunes which I really enjoyed. Stage 13 of the Dakar will see the riders go from Copiapo to La Serena which will include 353km of lesion and a 379km timed special.